I have to confess that I dont know what all the settings are for. I am only writing about the ones I know. As time goes on I will figure out the uses for the other ones. Please feel free to add your comments in the place below and I will continue to update this article with your help. 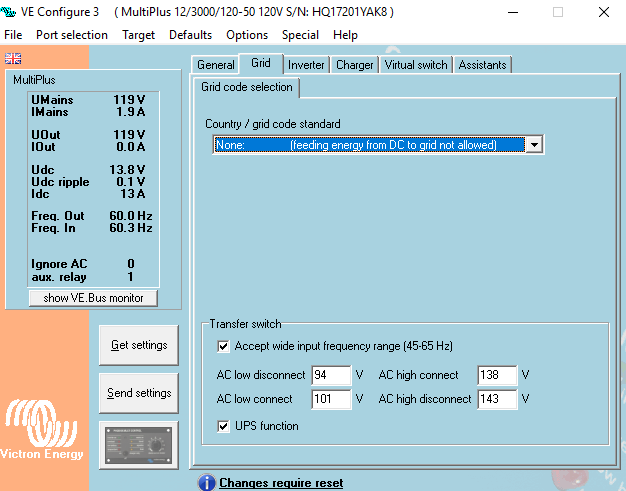 Frequency: You can select the frequency that the inverter will operate on, the choices are 50 Hz, typically used in Europe, and 60 Hz typically used in the US. By default the US version of the MultiPlus will come set to 60 Hz. Note that this wont change the incoming frequency so when running on shore power it will pass through whatever frequency is incoming. When inverting it will go with whatever setting you selected. 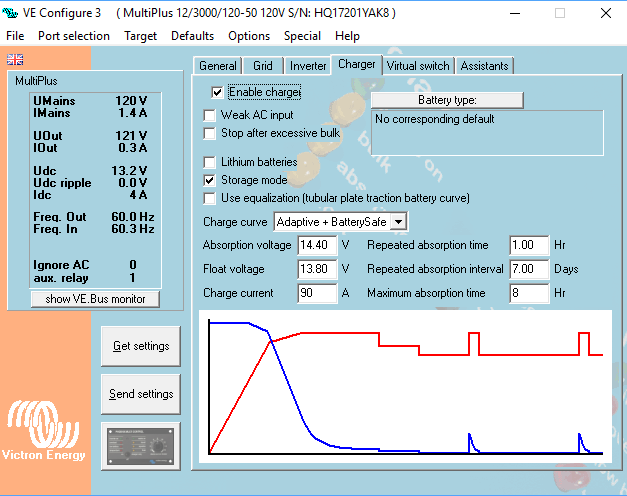 Shore Limit: This is the limit of power that can come in to the MultiPlus and is the sum of the pass through power and the power used for charging the batteries. As the pass through power nears the limit you set the amount of power used for charging will automatically decrease to keep the power within the allowed limit. If your boat or RV has a 50 Amp dock service you should set this to 50 Amps (the default), If you have a 30 Amp service then you should set it to 30 Amps, and for those more rare installations where 15 Amps is the shore power service you should set it for 15 Amps. The aim here is to set this up so you wont blow the breaker on the dock. Note that if you plan on using the Power Assist feature that defines the minimum acceptable setting for shore power. We will cover that in more detail when we get to the Power Assist feature. Dynamic current Limiter: I have to admit that I didnt know what this does so I had to look it up. This is what it does: This feature is intended to reduce load impacts on low-power generators, such as portable inverter technology models. These generators may be unable to respond to sudden load impacts. By activating the limiter, the PowerAssist function of the MultiPlus will absorb the change in load and transfer it smoothly to the generator, giving it time to react. The default setting for this is off. 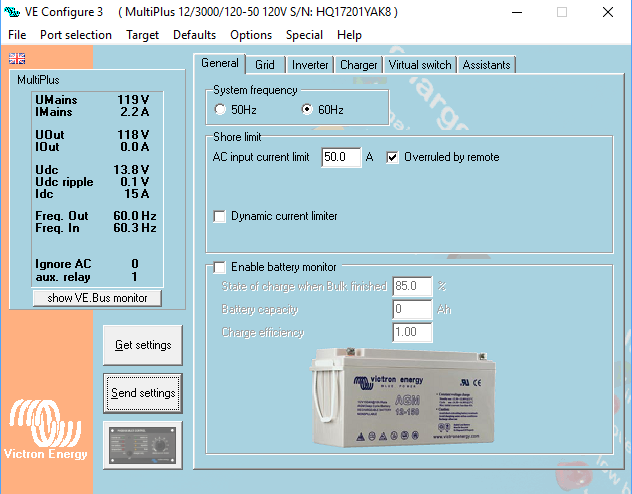 Enable Battery Monitor: If the MultiPlus is the only source of charge to the batteries and the only draw then it can function as a basic battery monitor because it counts what went in and counts what comes out. This kind of installation is used where the purpose of the system is to provide backup power for essential equipment when the grid goes out. I dont have any experience of this kind of installation so I cant say any more about it. You would have to have a Color Control GX or Venus GX connected in order to be able to view the information generated. I dont know if the new VE Bus Bluetooth Dongle will be able to show this information but I imagine it will eventually if it doesnt already. The image above shows the default settings of the grid page. The box to accept wide frequency range is checked by default. The AC low and high disconnect and AC low and high connect are pretty obvious. I dont really see where it would be appropriate to change these. The UPS function is an important one to note though. 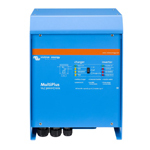 UPS stands for Uninterruptable Power Supply and when that box is checked the idea is that the MultiPlus can instantly start inverting in the event of an interruption in the shore power. The switch over is so fast that devices like computers continue working without interruption. The UPS function means that the MultPlus must keep track of the incoming shore power and follow it exactly. If the incoming power is a small generator and gets distorted when the loads are high it can become impossible for the MultPlus to stay in sync with it. If the MultiPlus cant keep in sync it stops charging. If this happens unchecking the UPS box will usually eliminate the problem and allow the MultiPlus to continue to charge batteries. The next tab we come to is the inverter tab. The default settings are shown below. 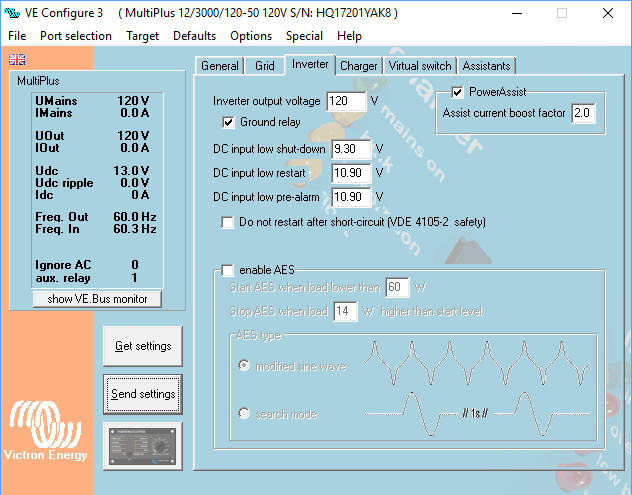 Inverter Output Voltage: This is by default set to 120 Volts and I dont see any reason to change it, but if you bought one of the European MultiPlus's that was by default set to 230 Volts and wanted to change it to 240 Volts this is where you would do it. Ground Relay: This is a specific function that relates to the Autotransformer that we wont go into in detail here. I will just explain though that by default when the inverter is the source of power it connects ground and neutral together, which defines which of the outputs is neutral and which is live. When operaing on shore power there is no connection between ground and neutral on board the boat or vehicle. Low Voltage shut down and low voltage restart: These by default are set to ridiculously low values so everyone should adjust these. By default they will run your battery totally flat. If you set the shut down voltage higher you will help protect your battery. 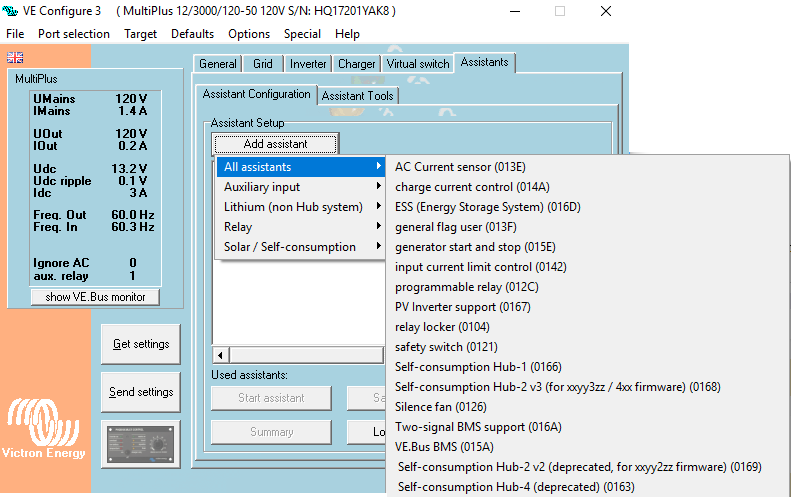 Those of you with Lithium Ion batteries will be particularly interested in these settings as they can be used to prevent over discharge of the Lithium Battery. The exact setting you choose will depend on your battery but 12 volts would be a good starting point for low voltage shutdown. There has to be a difference between the low voltage shut down and the low voltage restart to stop the inverter turning on and off repeatedly. When the voltage gets low and the inverter shuts off the battery voltage will recover somewhat as soon as the load is removed and if the low voltage restart voltage is not set high enough it will start right back up again and the cycle will repeat. 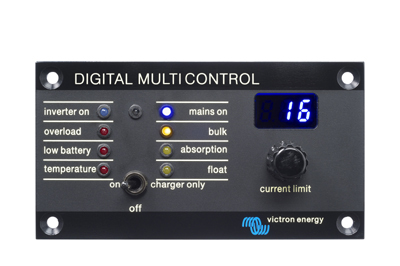 DC voltage pre-alarm: You can set an alarm to let you know the voltage is getting low. If you have a Color Control GX the alarm will display on the screen. If you dont you would have to add an audible beeper of some sort. We will come to that later. Power Assist: Power assist is the feature that allows the inverter to assist in starting loads. This is useful if you have a small generator and are trying to run an air conditioner. The inverter will assist the generator in starting the air conditioner and once it is running will cut back out and let the generator do all the work. This feature is on by default, I would suggest you turn if off unless you need it. Note that if it is enabled you might need to review the wire sizes you use in the installation since the output current from the MultiPlus can be greater than the input current. I found this video of the power assist function someone made to demonstrate this in action. Using Power Assist adds limits to the acceptable range of shore power current as discussed earlier. This article on current limits explains it better than I could. Enable AES: AES stands for Automatic Economy Switch and is a way to reduce power consumption at low loads. There are two options, neither of which are enabled by default. The first option is called Modified Sine Wave and fiddles with the sine wave output to reduce comsumption at low power. If you set it for 60 Watts and you connect a 50 Watt light bulb it will burn dimmer when AES is enabled. Im not sure this option sounds that exciting to me especially since I went to the trouble of getting a true sine wave inverter to begin with. The second option is much more useful to my mind. In search mode the inverter stays off but once every second or two turns on momentarily to see if there is a load connected. If there is it turns fully on. You can set the level of load required to trigger it to turn fully on. Enable Weak AC: This is one you dont want to check unless you need to because it will limit the maximum charge available. Weak AC allows the charger to accept very distorted input. If you have Lithium Ion batteries there are additional things we can do that will be looked at in the next blog post.